There I was checking and and double checking myself out. I didn't see any stray items (you know what I mean), everything was tucked in to the right places and all clips, knots and baubles were correctly hooked as I removed my cover-up. There I was on the edge of the community pool in my mom suit. You spent hours upon hours, rifling the racks at every retail store hoping to find something that covered and contoured to give you the best lift and shape for your body. Now you are thinking, "darn it, why did I worry so much about my body in the teenage years?" and "Why can't the bathing dresses of the 1920's come back in style." I get it, I have been there. My husband told me the story about how in Junior High all the boys had to wear school-issued speedos for gym class and how they hustled their bustles to get into the gym pool before the girls arrived for fear of them seeing them in those teeny weeny boy bikinis. Maybe that is how you feel -- hop into that pool fast enough and deep enough that no one will see what lurks below. Some of you may avoid pools and swimsuits all together because you don't like how you look in them. Can I give you a word of encouragement? Put on that swimsuit and get out there! The people that you care most about think you are beautiful and want you to! 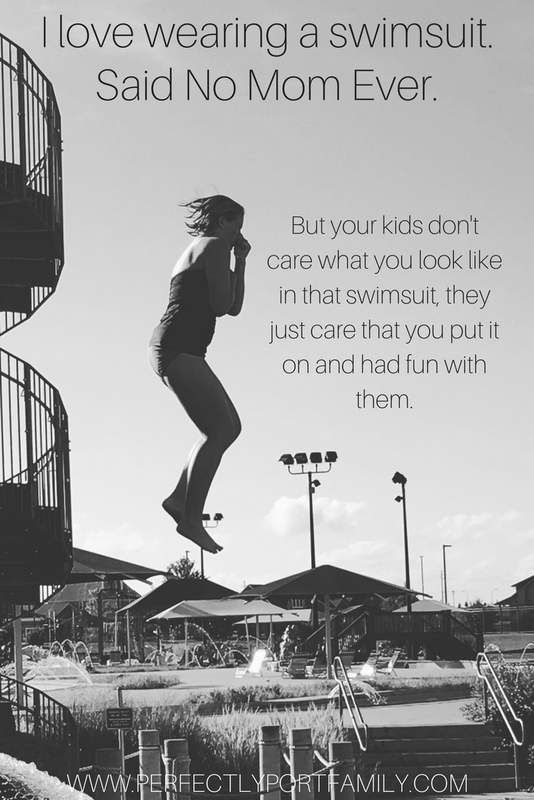 Put on your swimsuit because the people you most care about want you to. It might not be comfortable but if we want our kids to be brave, we need to be brave. You are beautiful. God made you in His image. You birthed babies with that wondrous body of yours. There is nothing to be ashamed of. We are often far harder on ourselves than anyone else. I venture to guess there is not a woman alive that loves every last inch of her body. No one is looking at you like you looked at yourselves in that full length mirror analyzing every stretch mark and cellulite pock mark. They are all too worried about what they look like in a suit and making a mad dash for the deep end too. What's more, get your hair wet. Your kids are only little so long. Someday you will be sitting on the pool's edge in that darling straw hat. For now get in and have fun. 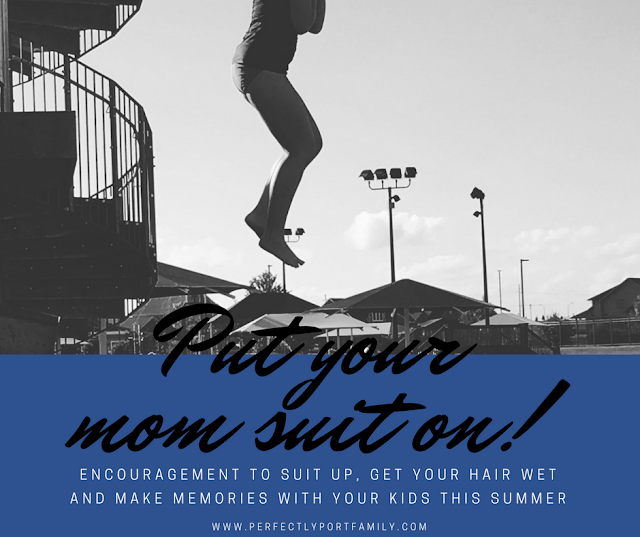 Get in the pool, get your hair wet and make memories with your kids. Who are you trying to please the random person you don't know or your kids? 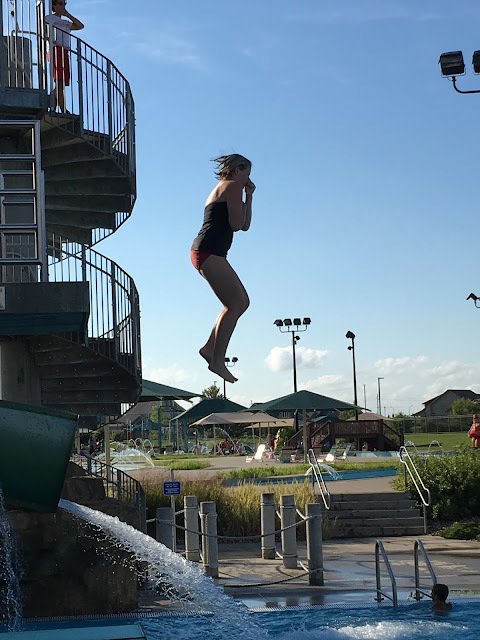 We all fight the temptation, but in 20 years they will remember you got your hair wet and the gal down the pool won't remember tomorrow. Mom, suit up, stand tall, and get out there. Memories are waiting to be made in your mom suit! Last summer I decided, who cares? Seriously, who cares? I am going to play with my kids, get my hair wet and have fun! I dare you to make the same pledge this summer. Be the mom that straps on that suit, gets out there and has some fun. 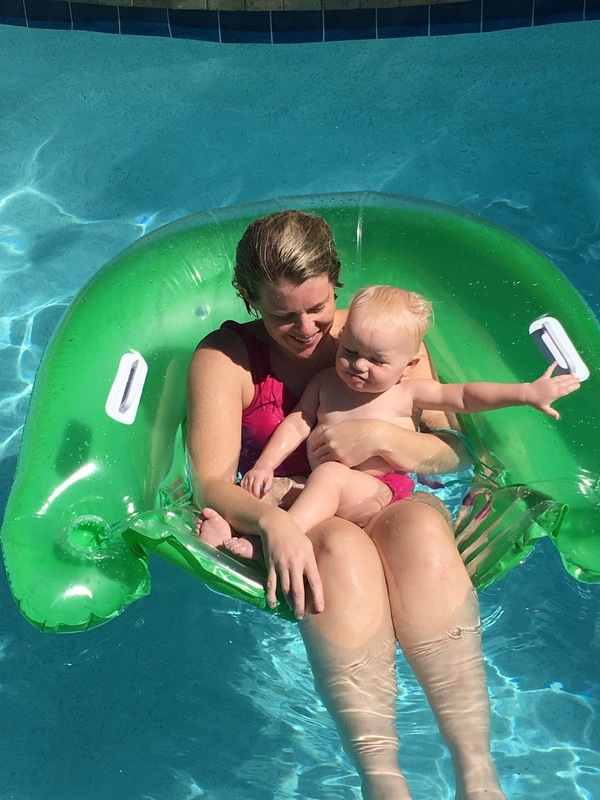 We only have so many summers, I want to make the most of it with my kids -- who cares what anyone else thinks. Pin and share this article -- thanks so much!